Tom Clancy fans, myself included, will not be disappointed as familiar characters return in the page turning action to which readers have become accustomed in Greaney’s writing. Few, if any, wasted paragraphs. The timely plot is of course North Korea. The new Supreme Leader Choi-Ji-hoon is more malevolent and even less stable than his deceased father. Driven to build a nuclear ICBM delivery system, Choi-Ji-hoon drives his subservient ghouls into a fiendish plot to source the cash to fund the project, through the discovery of valuable heavy metals in the mountains of the north. Profiteers join with America’s natural enemies in an unholy alliance with the North Koreans to carry out the complicated task of mining, marketing and converting into cash this new exploitable resource. Enter ” The Campus” and POTUS in an alliance to stop the madness. Mark Greaney’s research and storytelling approach cable news reality! 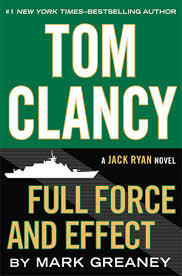 Tom Clancy fans will enjoy every page, satisfied that there will be still more of this great series.